In the year 1610, it was commonly believed that the Earth was the center of the Universe, that all bodies rotated around the perfect planet, placed by god with the heavens around it. Galileo Galilei dealt a major blow to this idea, by using an early telescope to improve his vision and look up at some surprising dots. These dots formed a line that went straight through the bright planet Jupiter. As Galileo looked again and again, night after night, he noticed that they not only persisted, they moved. Their motion was predictable, and Galileo realized that they were orbiting Jupiter, just as the Moon orbits the Earth. 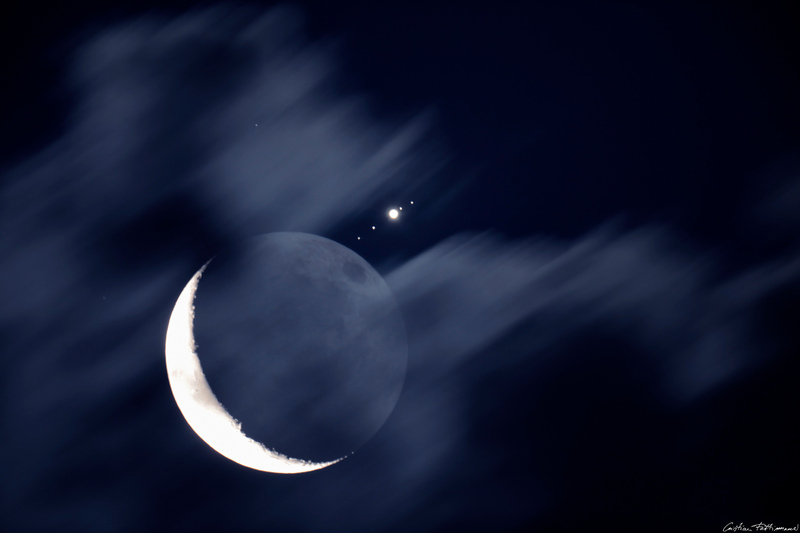 These were the four bright moons of Jupiter, named Io, Europa, Ganymede, and Callisto. Their discovery dealt a blow to the Geocentric model and gave support to the correct Heliocentric (Sun Centered) view of the Solar System proposed by Copernicus. With the image above, it is apparent just how easy it is to see the Galilean moons. They are just beyond a person’s limit of vision, and even a moderate pair of binoculars can make them visible around Jupiter. In fact, they are huge too. In the above image, the Earth’s moon is actually the fourth largest Moon in the image, after Ganymede, Callisto, and Io. Ganymede is even larger than the planet Mercury! Jupiter is bright and easy to spot all Summer. It will be brighter than any star, only being outshone by the Sun, Moon, and Venus (which isn’t visible far from the Sun anyway). So grab a pair of binocs or a telescope and go see what Galileo saw four hundred years ago!